I really like eggplant parm, but I personally think most local places cut the eggplant way too thin. You can't even taste the eggplant, it just tastes like goo in the middle holding two pieces of breading together. I prefer my eggplant parm with a nice "meaty" not mushy center. One note I should mention about picking an eggplant. I believe I learned this from watching Alton Brown on the Food Network. On the bottom of the eggplant, there is a dimple. This can be shaped like a dash or a dot. The dashed dimple is a "female" eggplant, while the dot dimple is a "male" eggplant. "Female" eggplants tend to have more seeds, which makes the eggplant bitter. Be sure to pick a "male" eggplant with the dot dimple. Also eggplants should still look glossy without any blemishes. Older eggplants are also very bitter. Freshness matters when it comes to eggplants. Slice the eggplant into 1/4 inch rounds. Lightly salt the eggplant and place in a colander over the sink for 30 minutes to 2 hours. This takes out some of the bitterness and water from the eggplant. It also prevents the eggplant from getting too oily when fried. (Basic organic chemistry: Salt is very polar (ionic), and cooking oil is very non-polar. They don't like each other much.). Rinse off the excess salt with cool water and pat dry. Set up three large wide bowl. Place flour mixed with some pepper in one bowl. Beat the eggs second bowl. And make a 1:1 mixture of breadcrumbs and parmesan in the last bowl. Bread the eggplant in the order: 1) Flour, shake off extra. 2) Egg. 3) Breadcrumb/Parmesan mixture, shake off extra. I read you can let the unfried breaded eggplant dry in the frig for a bit (30 minutes to an hour?) which results in a crisper product. Shallow fry the eggplant parmesan. Heat about one inch of of oil in a large frying pan to about 400C, this should fall to the correct frying temperature of 375C when the eggplant is added to the pan. (Some people insist on using Olive oil since this is an Italian dish. I don't think its necessary to use expensive extra virgin olive oil. Besides all the beneficial monounsaturated fats will be oxidized by the high cooking temperature and EVOO has a low smoke point. You can use light olive oil which comes from a later pressing of olives which has less monounsaturated fats. I personally use corn or vegetable oil.) Fry on each side until nicely browned. Drain on paper towels. I don't like my eggplant parm too soggy, so I usually just place it under the boiler to brown the cheese. Lightly grease a pan with olive oil or cooking spray. Place fried eggplant in single layer. 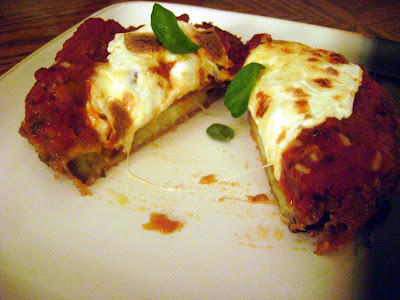 Spoon warmed marinara sauce on each eggplant and place a slice of mozzarella cheese. Thickness of slice depends on how much you like mozzarella, but I can tell you fresh real mozzarella is way better than that supermarket rubbery stuff. Place under broiler until the cheese has a nice toasty color. Eat over pasta with extra marinara and freshly torn basil leaves scatter on top.